Creative Infoway has emerged as one of the most trusted names in the field of mobile and web software development. With an exceptionally talented and passionate team of developers, we develop software that are rich in features. From entrepreneurs to enterprises, we serve industry-standard solutions that are scalable and profit making. 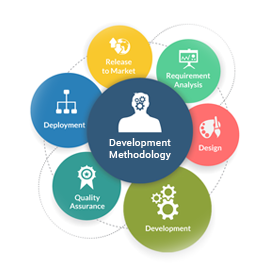 After the completion of the prototyping and architecture design phases, comes the vital phase of mobile application development process, and that is the development phase. This is the phase in which all the modules are programmed. The programming takes place as per the schedule, in multiple phases. Creative infoway follows standard coding and development practices as per the recommendations of the different platforms like Apple, BlackBerry, Microsoft and Android. Besides this, we have our own standards that help us to impart a ‘common look and feel’ to the code, no matter how many people have worked on it. This also improves the comprehension of the application and ensures that the basic documentation is always present. The coding standard also enhances the maintenance of the applications by improving the identicalness of the code.